Even in the rain, the trains ran! Because this is a garden railway, we've made every effort to place structures where soil & plants could not live. On the tongue over the battery box a hinged plywood platform, called the town square, holds two steel buildings built and donated by Eaglewings Ironcraft. They are open to the wind and view when we travel. On the left is an Eaglewings theater, still in need of signage on the marquee. Bill's battery-powered truck runs great and now BAGRS owns a battery-powered train with sound for one of the loops (thanks to Terry's donation from the BAGRS swap meet). This toy train will show viewers that it doesn't have to be expensive to be fun. On the right Grandpa's fancy house by Terry Hurley snuggles up to the mountainside with the newly painted boxcar to its left. The columned house is only a few inches deep to allow trees behind it and shrubs in the front yard. Eventually the trees on the mountain will grow another foot or so and obscure the viewers on the other side. We still need to ballast the track. We have glue but no ballast material, as yet -- we need a donation for it. Please help (even one time is fine) as there is still much to do before the next set-up at the annual meeting in February. 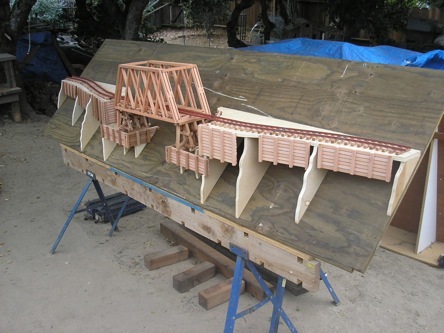 We need carpenters to build bridges for the lower loop and we'll start covering the plywood with lightweight resin scenery, like Bragdon's geodesic rockwork. This is your chance to get some experience working with craftsmen or helping others in a team effort. The public sure appreciates all your work. Some people walk all around the trailer and study all the details. We meet Wednesdays -- call Nancy at 925-408-9402. The next work party is Wed. Nov. 3, 9AM - noon with lunch at noonish. October 9 and 10 we put the battery to a test while running the pump and the mine train for over 15 hours on one charge. We backed onto the sidewalk in Pleasant Hill for their annual Art, Jazz and Wine Fest. Many viewers had never seen anything like this, maybe because it is unique! Kids were running around it while parents asked questions of our docents, Terry Hurley, Joe Winkle, Bill Swindell (here running his battery-powered red railtruck on the upper loop) and Nancy Norris. We handed out over a hundred BAGRS cards. Three other BAGRS members came and answered questions, too: Kermit, Moe and Frank Lucas. The trailer was locked overnight, but the town provided security people all night, too. This is a kid's-eye view of the point-to-point silver-mine line. The HLW mine train runs into an 8’-long acrylic box under the mountain featuring Dave Hartwig's detailed facades. The track was wired to the 12-volt battery that is housed on the trailer tongue. We had to allow the wire to be disconnected when not in use, in order to pull out the 8’ “drawer” to access the stored mine facades and mine trains. To step down the voltage on both the water pump and the point-to-point reversing unit, a DC dimmer switch was installed in each electrical circuit, and then we dialed in the correct "speed" to slow down the water flow and train speed. The intention is that this type of resistor will not just reduce the electric flow but also prevent wasting the battery so that we can set up the trailer for more than one day (as we did at this event) without recharging the 12-volt battery. Our resident electrician, Eric Moe, figured we could run our equipment for 24 hours, while the battery is relatively fresh/new. Our other electrical guru, Kermit Paul assured us that resisting power to the pump would not reduce its life expectancy, provided that it has enough power to push the water uphill. We towed the trailer to Just Trains in Concord on October 3 for the first test of the mobile garden railway. Trains ran non-stop on the two finished railroad lines for over 6 hours. The upper loop runs through a tunnel at the rear and onto a curved steel bridge in the front. The lower point-to-point line runs into the tunnel under the layout and onto the tailgate. Most all of the landscaping was completed the day before, after a daily, week-long work marathon by a devoted crew. Here’s what we had to do. The water feature, lined with pond liner material, began as a stream on top of the mountain, then flowed through half a drain pipe, which was screwed to the frame then mortared with Thinset, thin flagstone and pebbles. The pondless waterfall fell into a 10-gallon Rubbermaid tub with a hole cut in the cover for the water to splash and drain. Thin flagstones rest on the tub cover for appearance and easy access to the DC bilge pump in the tub. The water feature and mountain structure both traveled well with no cracks in the mortared rock waterfall. The left lower loop has been graded with a beautiful set of retaining walls, bridge and hand-laid track by Daniel Smith. We'll be working on the rest of this loop next week. Soil has finally been added to the trailer. Plants are positioned but not planted yet. The mountain needs some more mortar work and the water feature is prepped for mortar. All mountain feather rocks have been drilled and screwed to the pressure treated 2x4-frame that holds the mountain together as it bounces down the road. A few mountain trees have been stuffed into the feather rock holes which have been hollowed out to plant with trees. We still have some blue masking tape around the town square because we still need to paint one last coat to make it look like a road. One more building will live just behind the railbus. Track needs to be laid. Help! We have a venue Oct. 3 if we can get it together. If you can help. The railway has to have an industry and it just happens that the wealthiest man in Silver City owns (you guessed it) a silver mine. On the trailer gate, about 4'x5', the Silver City Mine and it's buildings are false fronts against the hillside. The point to point mining engine and car kits have been ordered from Hartland and will need to be built by one of you. Please call Nancy or email her if you'd like to put together some easy kits and paint them. Thanks, Dave Hartwig, for the nicely detailed mine offices and double portal! Tongue box is mounted. Battery and charger are installed. Society fabricated the steel box mounted to the tongue. The battery box is bolted onto the steel box. To the left of the deep-cycle marine battery, a charger is mounted through the left side of the box, so the lid doesn't need to be lifted to charge the battery. Just plug'er in (see orange cord). The back side of the tongue box has a hole for wires to the water pump and other electrical items. The town square fits around the tongue jack and is hinged to the trailer for lifting to access the battery. Daniel is in the process of building the structures necessary to carry the trains across one side of the hinged trailer gate. Here's the progress pictured, left. More wooden retaining walls will be built, then faux stone cliffs will cover the plywood. Although he took the side off the trailer, we figured the angle while it was on the trailer and he replicated that angle at home to work on getting the roadbed level. Our latest helpers, pictured, are the Smith girls who made Sculpey (clay) bakery goods for the bakery window. Little fingers made little cakes and cookies. Next time they'll make figures as they already know how.Susan and Dave helped to cut backer board for the mountain frame and made scenery, too. John submitted his plan for a metal suspension bridge and the rest of us started screwing the plastic roadbed to the steel frame over the trailer's wheels. Daniel took home one trailer side for fitting with a series of wooden bridges, trestle and retaining walls all with hand-laid track. Terry's paint job on the metal buildings looks great and ready to install. They will be mounted above the battery box, now purchased, be part of the town, and be visible while the trailer is traveling. Frank and Donna made us all a lovely BBQ lunch at their house where the kids went swimming. Then we paraded over to Kermit's for a tour. Big day! We still need YOUR help! Lots to do. We have our first venue in October, finished or not. Let's make it finished! After our normal Wednesday work party, yesterday, Bill and his son Patrick welded the fasteners for the sides of the trailer over at their house and Bill hauled it back to my house without all the jury-rigged rope and bungies around 5:30pm. They welded an angle iron piece on top and across the front vertical posts and welded a hasp on each end. We plan to use this bar for a banner and eventually for solar panels. At the rear, he welded a short angle piece from each post horizontally over to the rear corner of the sides. We then screwed the other end of the hasp on the top four corners of the two sides. To keep the front lift out gate from wiggling he welded a fifth hasp to the center of the front horizontal bar. We are using bungies on this hasp to hold the steel curved girder bridge upright during travel. Lastly he welded two shorter hasps half way up both of the rear posts to fasten the hinged winged side panels which fill the gap between the rear gate and the side gates. They also cut off the spare wheel mount that was on the front of the trailer. At the front of the trailer they welded on two small hinges which will be the platform for two metal buildings on the outside of the trailer over the tongue. The platform will be hinged plywood so that we can lift it out of the way of the battery box below it. We discussed the battery box and Bill suggested getting one shaped for the tongue and large enough to hold the tarp and charger in addition to the battery(ies). We still need an expert electric person to advise on the type of battery and other equipment. Bill will weld mounts for the battery box when we get it. I can't really build the water feature without the battery in place. Next Wednesday we will continue building the mountain frame we started this week. John will show us the plans for a fancy metal suspension bridge on one of the sides. Terry plans to bring the metal houses he painted so we can install the plywood foundation over the tongue. We've decided to get rid of the plastic roadbed above the wheel wells because it's warping out of control. We'll need to cut some pressure treated plywood for that. Lots to do -- again. Ed and Terry are completing construction of the front and side gates. Joe is testing the railbus's fit on the newly painted steel bridge. Next work party we'll have fasteners attached to keep the sides in place during travel. We're thinking of painting it to look like a boxcar.